Situated round the back of Trzech Krzyży (enter from Nowy Świat), this courtyard bar has become the new great hope of the nocturnal city. Open from early evening (hours will, apparently, be extended come September), it’s a glorious, hidden enclave that feels fresh in its approach. 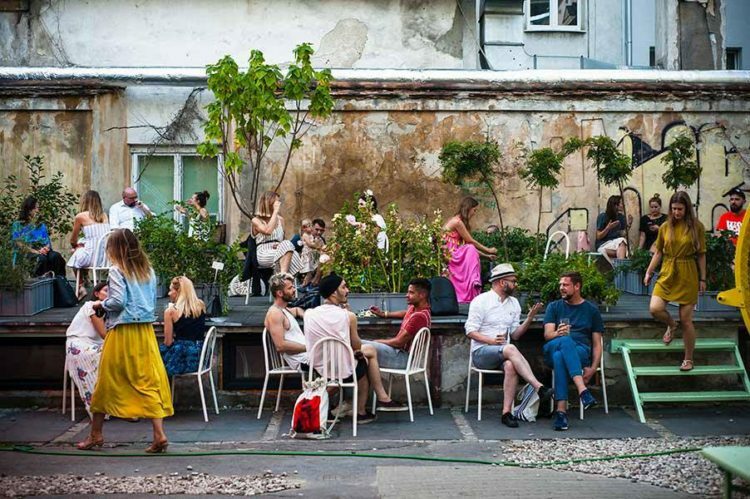 Founded by the same people that once ran the original ‘ruin’ bar at Hala Koszyki (back when it was a decrepit pile of wobbly, black stonework), the idea is simple: find a courtyard decked out with flowering plants and crates of herbs, an open-air grill specializing in vegetables, and a 200-year-old carriage house inside which lies the bar. And my, what drinks it serves! While the beer front is (currently) limited to boring old Pilsner, cocktails are a different matter entirely, and incorporate sprigs of lavender and rosemary to maximum effect. Then there’s the Prosecco, arguably the cheapest glass of bubbles that you’ll find in the city. But that all feels like window dressing; the most important factor is the atmosphere. Open to all, it’s a place that attracts every walk of life: from old, local gossipbags to those at the peak of the social heap.